Ay, me hearties ye must always '˜ave ye a pirate in yer chest! What swashbuckling affair would be complete without the thrills and adventure of Jack Sparrow and his sea faring side kicks, Will Turner and Elizabeth Swann? The action-packed high seas happenings are brilliantly displayed on the Pirates of the Caribbean inflatable series making any celebration a seaworthy one. 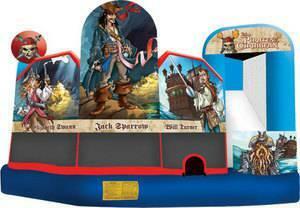 Pirates of the Caribbean inflatables are available in different popular styles. The Combo style is hands down, the grandest of our licensed combo styles with over 250 square feet of brilliant artwork! The 5-in-1's provide ample jumping area, basketball hoop, log and pop-up obstacles, a climb feature and a slide that exits to the outside of the unit for easy exit or easy re-entry. High-visibility mesh around all sides allows spectators to view easily. Unit manufactured with lite n strong™, the only 15 oz lightweight.